When you do "what you're supposed to do", diabetes is supposed to play along - isn't that what we're always told? - but we all know that isn't always the case. And yet, sometimes you do "what you're supposed to do", and it goes inexplicably well. Without the benefit of hindsight, you never know for sure which way it's going to end up. In fact, some days, things go so well that I start questioning the accuracy of my equipment, instead of congratulating myself on my success. And the last 10 or so hours have been exactly that way, folks. I didn't take a picture of what preceded this, but I should have - a very ugly spike, up to 359. For some reason, I chose The Plague for dinner, thinking I could conquer it. I could not. I felt tired, grumpy, and frustrated. My brain was telling me, quite obnoxiously, "I told you so!" 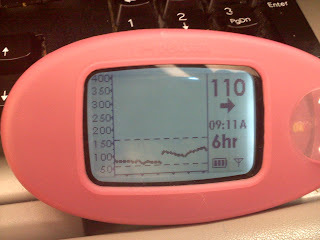 I rage bolused my way out of that BS (and "BS" does not stand for "blood sugar" in this case), and expected the usual rebound low - but it never came. Instead, I had that flat line you see on the left of the screen all night. To amplify my confusion, my daily breakfast and coffee routines produced little in the way of ramifications. Coffee always makes me spike. Multiple blood tests confirmed this anomaly. How? Why? I have no answers. I have heard from many people that when you are very high, you become more insulin resistant, so it takes more insulin than usual to get you out of a high. That's why it sometimes seems like our corrections don't work, and why when we rage bolus, we don't get the expected drop. A couple doctors have told me that when I'm 300+ or 400+ to add several extra units on top of the usual correction. So totally off topic question - where did you get the cool cover for your dexcom?? Its funny that I find myself doing the same thing, thinking I could beat my plague every once in a while but I always end up failing miserably, Cant bolus as a T2 but that extra dose of Insulin helps now that am on Insulin. With this disease, you think you have learned all the quirks and then it changes. Thanks for the comment, Allison! I also SWAGed that rage bolus, so there's that, too. I find that those really high numbers need an extra kick of insulin, too. eml210 - The covers (I have 4 of them, in various colors) are actually made by Dexcom. I will be doing a post about them tomorrow! Rage bolusing... Sometimes necessary, other times dangerous, you just never know what you're gonna get.